Upper Normandy is the ideal nature lover’s retreat, Haute-Normandie in French. This beautiful region has the lower end of the Seine flowing through it; which boasts several walks, hiking trails, beaches and other attractions. Your Rouen motorhome rental, RV and campervan hire; which you can book from several operators like Pure Motorhomes and McRent France Rentals; will allow you to venture into the heart of this historic and restful corner of France. Rouen is the Upper Normandy region’s capital and rests on the River Seine, about a 90 minute drive from Paris by campervan rental. One of the prosperous capital cities of the Anglo-Norman dynasty; the residents of Rouen ruled England and large parts of present-day France from the 11th to the 15th centuries. Rouen is a quaint and historic city, home to French author Gustave Flaubert – spend the afternoon at the Gustave Flaubert museum or else take a moment at the simple, haunting field of flowers commemorating the site where Joan of Arc was burnt at stake. 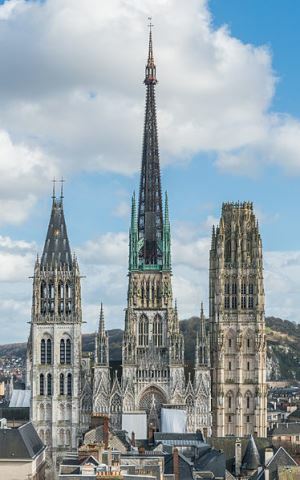 Before you take your Rouen motorhome rental out of the city to take advantage of the excellent trails, make sure you visit the incredible Notre Dame cathedral – it’s beautiful, and you’ll see why it inspired Monet to paint over 30 canvases in its honour. Interestingly, the Tour de Beurre (butter tower) of the cathedral was paid for by the sale of Catholic indulgences for butter during the time of Lent. Also, in the 19th Century, the cathedral was for a short time the tallest building in the world. The Place Saint Marc is an enchanting morning market open until 13:00 on Saturdays and Sundays. Lastly, visit The Jardin des Plantes de Rouen Botanical Garden. Dating way back to 1840, it used to be owned by Scottish banker John Law, and is home to breathtaking country landscapes and garden walks. With Rouen as your base, your RV rental or motorhome hire in Rouen can take you out and about in Normandy to immerse yourself in nature. The La Source Hautot sur Mer is just one of the many excellent camping sites quite close to the coast. Pull on your hiking boots and get lost in the luscious forests and trails; or rent a bike to cover more ground. Here you can find good quality artisanal fare, antiques and knick-knacks to round off your trip. Drawing on the lush, tranquil forest surroundings; visit Tapovan Normandy Yoga and Massage Centre in Hameau de Anneville. Tapovan is an Ayurvedic spa offering massage, Reiki, vegetarian cooking and specialized treatments. Once you feel refreshed and balanced, you might choose to take your Rouen motorhome rental for a slow meander along the Seine River; stopping for a picnic or a poke around the many charming villages. Le Crevierit is another spot bursting with natural beauty. Pack a light lunch and take your campervan hire in Rouen out for a day trip; whilst soaking up the stillness of the beautiful apple orchards. For the WWII history aficionado; a two-hour campervan rental trip from Rouen to the D-Day beaches, via the historic town of Bayeux, is highly recommended. The town itself is worth stopping at if only for its impressive tapestry. The Bayeux Tapestry chronicled, in visual form, William I’s conquest of England in 1066. En route to Bayeux, you can take a jaunt to the UNESCO-listed port city and cruise hub of Le Havre (‘the harbor’), at the mouth of the Seine.